Access every feature from any tablet, laptop or NFC enabled device. Easy to use with your privacy fully protected. workXid is device independent! Your device just needs internet browser and internet network connectivity. How does WorkXid™ work? Each member carries a photo ID card that is uniquely encoded with a token supporting both Near Field Communications (NFC) and Quick Response (QR) 2D barcode technologies. Member information is maintained and managed by workXid™ through Software-as-a-Service (SaaS) subscription. Under that service, workXid™ undertakes the primary role of data custodian. Members always own and retain responsibility for their records. Access is limited and provided through role-based rules. The colour coded status indicators show you are ready to work! CHECKED (Green) - No warnings. CAUTION (Yellow) – Minor warning that may require attention. WARNING (Red) – Major warning that requires immediate attention. Worker Authentication: by checking that their Photo, Name, Trade and Trade Level match their membership card as presented. Employer: Identifies current employer name and if the employer carries insurance. Access to detailed member workXid™ records is only granted to participants who meet login security authentication— tightly managed and controlled by workXid’s Workforce Identification Services Engine WISE™ software. A member’s view is based on an assigned workXid™ role. All data is kept secure through encryption, similar to what is used in internet banking. We provide audit reports for statistical and/or security purposes. The member status will remain “Not Authenticated” until an employer, union representative, or authorized trainer verifies their credentials. Uniquely combining the latest technology with an innovative range of cloud accessible functionality. Your data is secured on 100% Canadian owned and operated servers. The workXid™ system utilizes a high level encryption and authentication methodology. The design is based on field level security, meaning every element of information can be secured independently so that access to information is always limited to only what is required and/or what is permitted by law. workXid™ complies with the Privacy by Design Centre of Excellence guidelines. PPI (Personal Private Information): workXid™ will NEVER REQUEST your SIN (Social Insurance Number) or driver’s license. ﻿Verification (cardholder): To protect the sensitive file information on the system, a correct username/password is required before the member cardholder is allowed to enter the system. workXid™ logs from where and when each file has been accessed and maintains a record of all queries. Upon notification or suspected breach of personal security, the member ID in question will be shut down until new verification credentials have been issued. Choose to directly email your credentials to people that need to know. 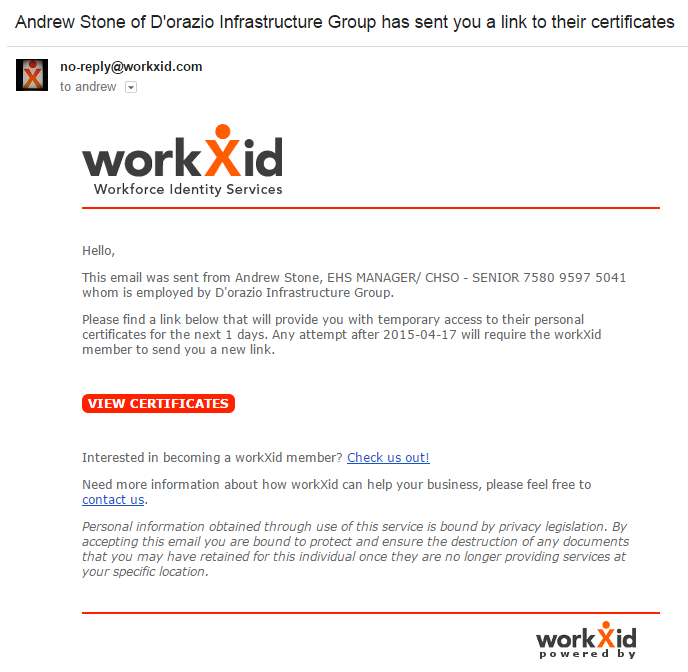 workXid allows the individual member to send an email to provide credentials to a prospective new employer or job site Forman. That email provides a time sensitive active link to allow the email recipient access to the sending member’s credentials. The recipient does not need to be a workXid member. Once the time period expires the email recipient access is revoked. Plan for the future with a clear 360 degree view of employee credentials and time at work. workXid provides mechanized notification to the member and employer of pending expiring certificates. No more surprises when an employee reports to a jobsite with expired credentials. Capture when your employees arrive and depart a job site (workXid Tag In/Out feature). Job site owners can check all records of individual members that have reported on their specific job site. You need someone with specific training (i.e. confined space)? workXid gives the site owner the ability to canvass all members certifications reporting to a job site. Have a medical emergency on a job site? workXid provides restricted access to a members specific encrypted medical info profile. Need to send a message to an employee? workXid provides a private encrypted messaging system to converse with employees. Access up to date training, Tag In/Tag Out and custom reports with the touch of a button. workXid provides many standard reports to allow an employer to activity manage their workforce. List of all employees by trade and trade level and their certificate status. List of all job sites and other locations. Access to company employee Medical info. Employee Tag In/Out by employee name or location. List of all employees certificates with issuer details and access to physical copies.